Schmetz Universal sewing machine needles were developed to perform well on both woven and knit fabrics. The slightly rounded point allows you to use Universal needles on most sewing projects. 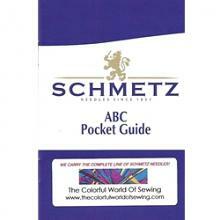 Schmetz also makes an array of specialty needles for different fabrics and sewing techniques. Size 120/19 is the largest size needle available for the heaviest fabrics but also for hemstitching on fine fabrics when heirloom sewing and for purposely punching holes in different materials when embroidering.